The Assessment, Effectiveness, Planning, and Budgeting Process at Arkansas State University is a dynamic, mapped process of collaborative practices. ASUN assesses, determines effectiveness, plans, and budgets to provide continuous improvement, accountability, and transparency in accomplishing our mission of providing an accessible, affordable, quality education that transforms the lives of our students, enriches our communities and strengthens the regional economy. There are three major components of integrated Academic Assessment and Planning unique to academe at ASUN: Program Assessment, Institutional Learning Outcome (ILO) Assessment, and Academic Master Planning. Program Assessment includes both course and program assessment. ILO Assessment assesses within programs and at the institutional level for three institutional learning outcomes: reasoning, communication, and responsibility. Academic Master Planning includes internal and external assessments to plan for academic program sustainability and expansion. ILO 1: Communication: Students will express ideas, knowledge, and concepts in a clear and concise manner. 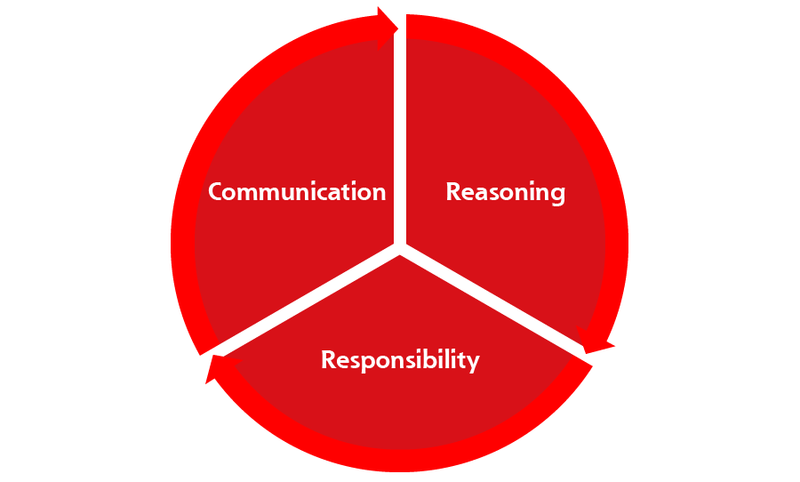 ILO 2: Reasoning: Students will apply reasoning skills in a variety of environments, which demonstrates problem-solving and applied knowledge. ILO 3: Responsibility: Students will participate in service activities that instill in them a sense of social responsibility. These plans are informed by Academic Assessment, Non-Academic Effectiveness practices, Planning, and Budgeting and, in a spiral fashion, inform Academic Assessment and Non-Academic Effectiveness, Planning, and Budgeting. In addition, the Chancellor’s executive cabinet is tasked with ensuring departmental initiatives and resources align succinctly with the mission, vision, and values through measurable and focused departmental outcomes and initiatives. The institution will continue to communicate the mission, vision, and values through digital signage, environmental graphics, and through purposeful institutional advancement efforts. In addition to institutional level practices listed in Chapter 2, ASUN ensures effectiveness through departmental level practices inclusive of data dashboards, assessment of departmental outcomes, and yearly data reviews. These practices are documented with a Departmental Effectiveness Portfolio submitted to the Planning and Assessment Council in December of each year to inform the budget process. The process for Departmental Outcomes Effectiveness/Student Learning Outcomes Assessment in non-academic areas is ongoing and instituted to measure and improve departmental quality and opportunity for and assessment of student learning. It involves identifying expectations, setting measurable standards for those expectations, and gathering, analyzing, and interpreting evidence to determine institutional effectiveness. When effectiveness is below expectations or when increased performance is desired, interventions are identified and executed. Following execution, evidence is again gathered, analyzed and interpreted to determine the effectiveness of the intervention. This is a cyclical process that provides for continuous improvement. Six departments in the college identify outcomes: Finance and Administration, Strategic Initiatives, Economic and Workforce Development, Alumni and Community Relations, Information Technology Systems, and Student Affairs. Also, the Advising Task Force identifies advising outcomes. Effectiveness results of outcomes are included in the yearly Effectiveness Portfolio* and are reported to the Student Learning Assessment Committee. Throughout the year, data is released in the form of survey results, internal studies, and reports from third parties such as the Integrated Postsecondary Education Data System (IPEDS), the Arkansas Department of Higher Education (ADHE), and ACT. This information is provided to members of the Executive Cabinet and others as needed. Institutional Research also maintains a repository for these reports. This data is used for formative and summative purposes throughout the year but is also a part of the end-of-the year data review process. Each department maintains a folder of reports received during the year and reviews this data prior to completing the Effectiveness Portfolio in December. Often departments gather information for departmental purposes such as surveys conducted at departmental events or after departmental performance. This information is reviewed and may become a part of the end-of-the-year Effectiveness Portfolio. The results of the Data Review and the implications for Planning are captured in the Effectiveness Portfolio at the end of each calendar year that includes the Data Review Process. Completion of the Effectiveness Portfolio is a process that will place in December of each year for non-academic departments and advising. For each department, it includes the documentation of the dashboard review, outcomes effectiveness review, and data review. It is derived from the ASUN Assessment and Effectiveness, Learning, Planning, and Budgeting Model that is included in this section prior to the Effectiveness Portfolio Form. These completed forms are submitted to the Student Learning Assessment Council (SLAC) in December for review at the January meeting. Permanent copies of these reports are archived in the Office of Institutional Effectiveness and Academic Outreach. Two activities comprise the budgeting process: yearly budgeting and the mid-year budget review. Major assessment and effectiveness activity occurs from May through December at the College on a yearly basis. Planning follows from December to mid-February with important budgetary implications identified through the planning process. The actual budgeting process begins on or near February 1st. Budget managers complete budgets and submit them for consideration with the previous year’s budget available for review. One of the most critical elements in promoting institutional effectiveness is through the allocation of resources in a manner that is aligned with ASUN’s mission, goals and strategies. Because budgeting has a direct influence on results and a direct effect on performance measures, it is imperative that this process be conducted in a manner that involves broad based inclusion and communication. The most effective method for achieving this is to fully integrate the budgeting process with the goals of the university. Beginning with fiscal year 2015, ASUN moved from a system of incremental or historical budgeting to zero-based budgeting. There is a significant difference in incremental vs. zero-based budgeting. Under the incremental based system, historical budget balances are brought forward from the previous fiscal year. Under zero-based budgeting each department begins budget development from a “zero” base and justifies recurring expenses that are based on activity from the previous year. Under zero-based budgeting, careful attention is given to justification of expense levels. Critical evaluation of expenses is used to align resources with the strategic goals of the university. Within the strategic budgeting framework for FY15, budget managers who request new or replacement equipment, software, or other capital resources will be required to identify and justify each request in the budget process. This process will help to ensure that new or additional resource requests are given the due diligence needed to fund the initiatives that support the mission of the institution. Noting the institution has an obligation to keep education affordable and that state funding is decreasing, this method will provide the most effective and stable economic basis. An accountability based environment necessitates fiscal prudence. This will allow ASUN to better provide the programs and services needed in the communities we serve and to be responsive to industry needs in facilitating economic development.